Since hotels are accommodating guests from all over the world, the food they cook and serve has to be of top quality. Even dormitory type hostels or inns need to have great-tasting food for the tired and hungry guest. Hotels have a dual purpose: accommodation and food. They are not only meant to be sleeping quarters, but also provide a venue for top-notch cuisine which can be enjoyed not only by hotel occupants but walk-in guests as well. The hotel menu serves as a reflection for both the hotel and its restaurant or bar. 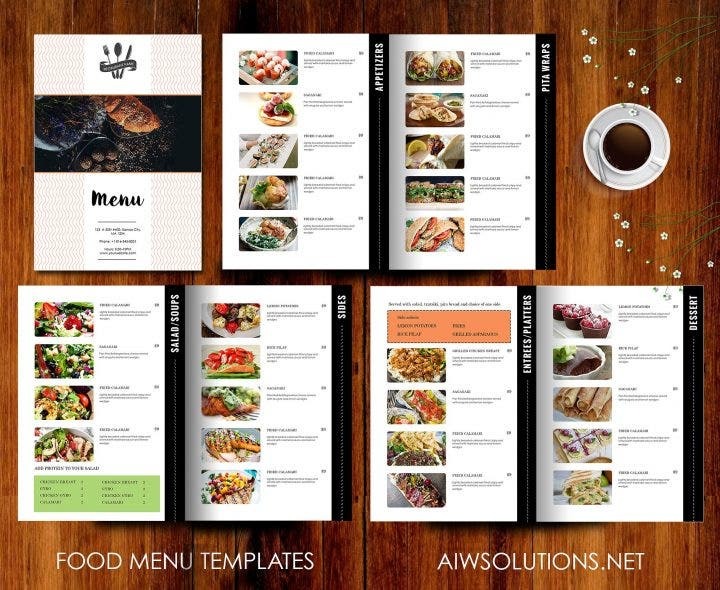 It has to go through strict planning and the final menu design has to be well-designed. 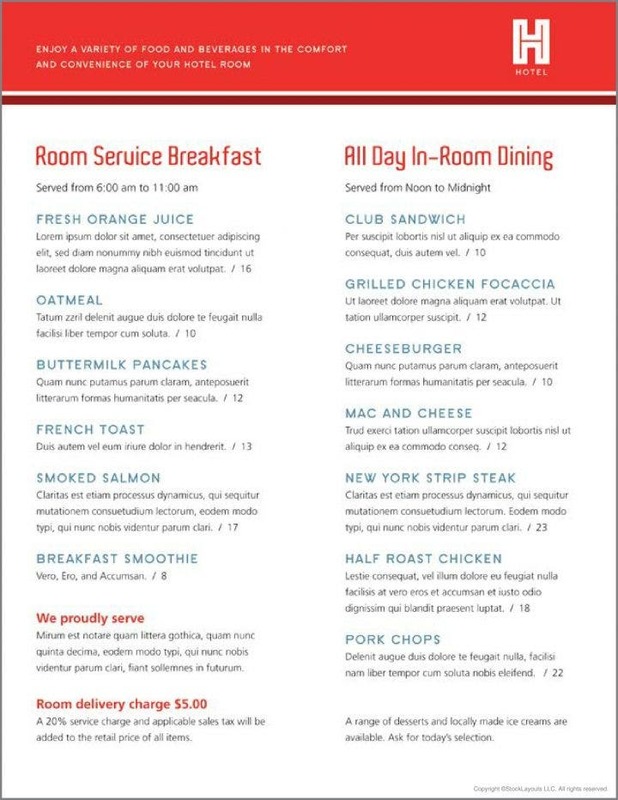 Here are some hotel menu designs to use if you’re planning to start your own hotel business or know someone who plans to do the same. 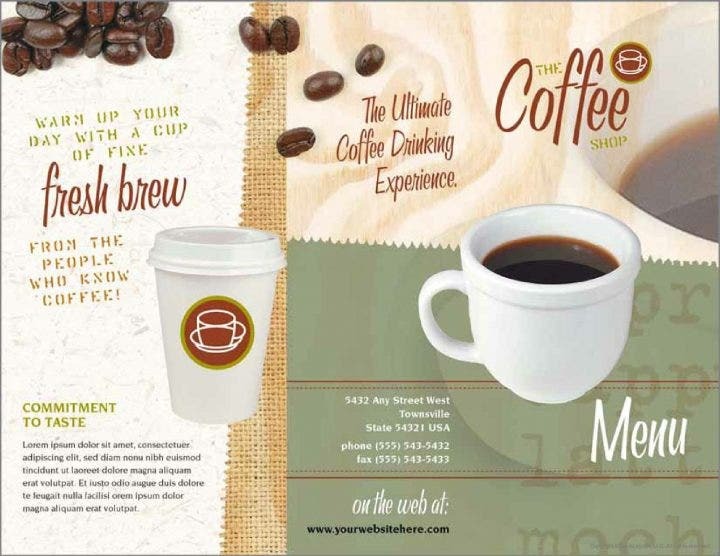 Coffee has always been a mainstay in any location, either an office, school, hospital, shopping store, or accommodation. The health benefits that coffee brings has made it an extension of people’s lives all over the world. People take coffee in the morning, afternoon, evening, at breakfast, dinner, in the gym, at work, and even in the bar (when it’s mixed with some other drink). The history of coffee has also made it an integral part of some countries’ culture and even literature. Hotels have their own coffee shops in which guests can easily order for room service. 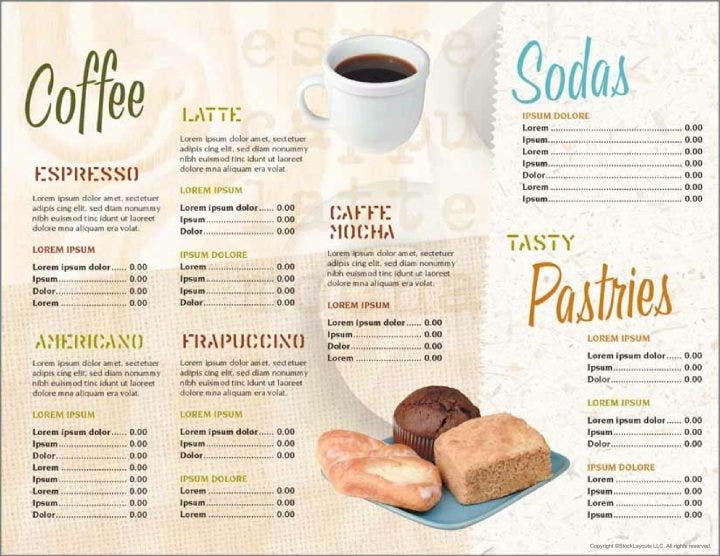 This coffee shop menu design has a clean and elegant look which highlights the coffee itself. The cup is perfectly positioned at the center of the design in which another image of a cup is shown in the background. The design’s green and brown colors match the coffee’s dark brew. 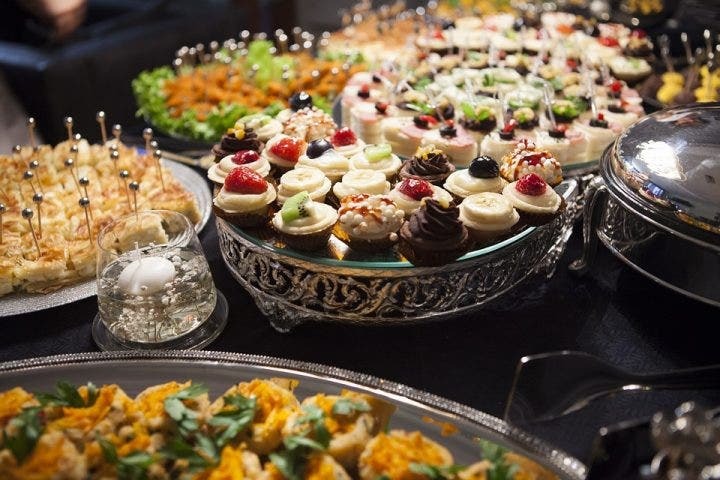 Delicious photos of pastries are also found in the menu to entice the guests. 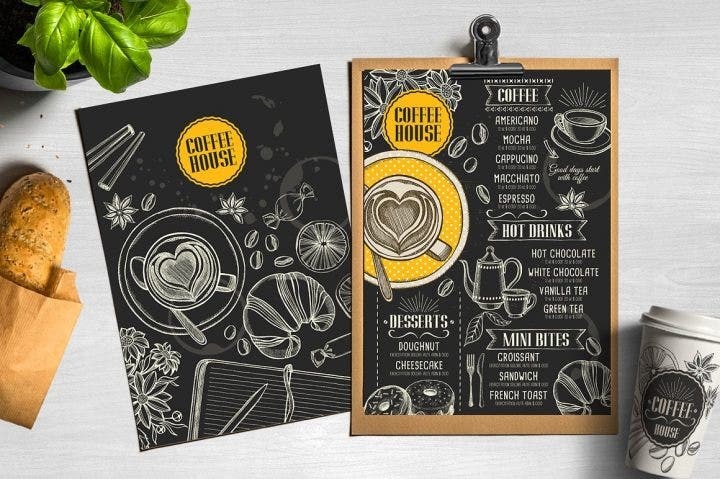 This coffee shop menu design made with a chalkboard concept has some nice details and can be definitely used for a hotel coffee shop. The text resembles chalk writing, while the images of coffee, pastries and bread form a combination of pencil and chalk sketches. The highlight of this design is the latte heart cup, which is beautifully sketched and is surrounded by yellow polka dots. Due to its popularity, chalkboard designs have been used in every sort of media. From newsletters, seminar invitations, wedding menus, posters, and tarpaulins, chalkboard designs are seen everywhere. It’s a design fad that has gone on for years, but its designs have also evolved, making it more of a mainstay in design-making. With what started as a simple black chalkboard with chalk erasure designs, different styles of art like pencil sketches (as seen above) and paint colors have been integrated in chalkboard designs. This Art Deco-inspired menu design incorporates some of the best Art Deco styles, especially the intersecting geometric lines and shapes occupying a third of the menu. The lines are then colored with a combination of blue, red, and orange colors with some shadows added for a better visual effect. Despite the image of the soup dish taking much of the menu’s space, the visual impact lies in the Art Deco design instead. The Art Deco period, which began in the 1920s and lasted up until the 1940s, saw some of the best designs in history and heavily influenced architectural designs and literature for two decades. The influence of Art Deco still continues up to this day where designs have a more abstract and futuristic look. Famous Art deco works include Rio de Janeiro’s Christ the Redeemer statue, New York’s Empire State Building and the Rockefeller Center, and Tamara de Lempicka’s Young Lady with Gloves and Self-Portrait in the Green Bugatti paintings. 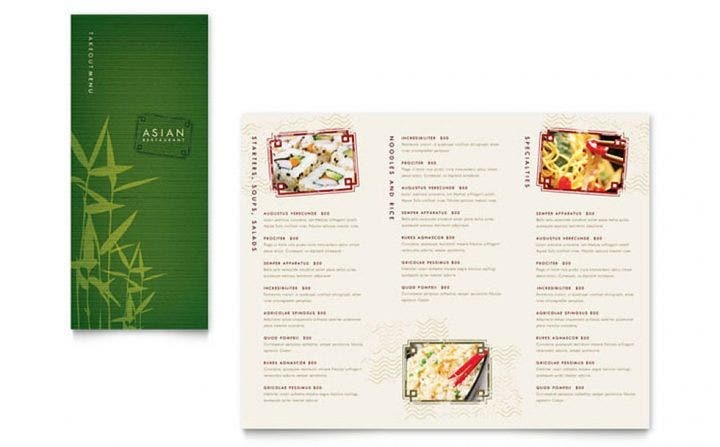 This bamboo-themed menu design perfectly represents an Asian-inspired restaurant. The bamboo plant, commonly found and abundantly growing in China, Taiwan, Thailand, Japan, and other countries in South Asia create an accurate representation of Asia. These sturdy and tall plants are not only food for animals but offer health benefits as well. This beautiful bamboo-themed design uses a bamboo silhouette as the central image and is paired with a green gradient which is used as the main background color. The menu heading is also written in an Oriental-style font. Taking high-quality photos of food and adding them in the menu is one of the best ways of increasing a customer’s appetite. Food photography menu designs are also some of the easiest designs to make as the photos give enough detail and attention to the reader. Filters also add to the overall visual effect of the photo. 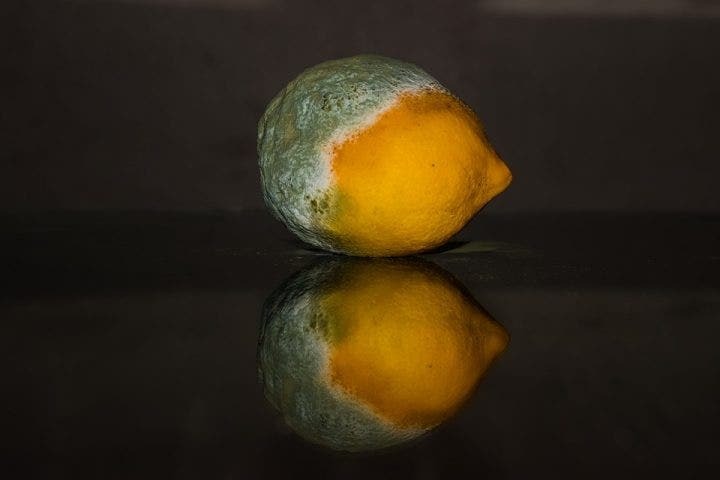 A simple dish can be transformed into something more appealing if taken with a beautiful shot. Additionally, other designs in the menu can be limited if great photos are used for the menu. This food photography menu design shows a freshly baked croissant with truffles on the front cover. The rest of the menu shows some very appetizing photos of appetizers, salads, pati wraps, side dishes, entrees, and desserts. A white background is all it needs to complete this menu design. 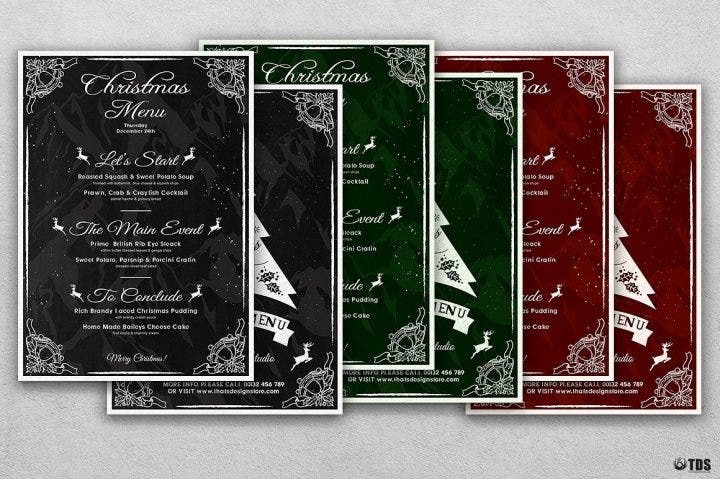 This Christmas-themed menu design can be used for hotels offering a special holiday menu. Available in three colors (black, green, and red), this design can bring out the festive mood in your guests. The Christmas holly berry and bell occupy the borders of the menu while little reindeer and snow surround different areas of the design. Christmas themed designs are celebrations themselves and are in tune with the holiday season full of gift giving and parties. They also don’t have limits on how they can be made as most Christmas themed invitations and letters are filled with glitter, pop ups, and a variety of color. 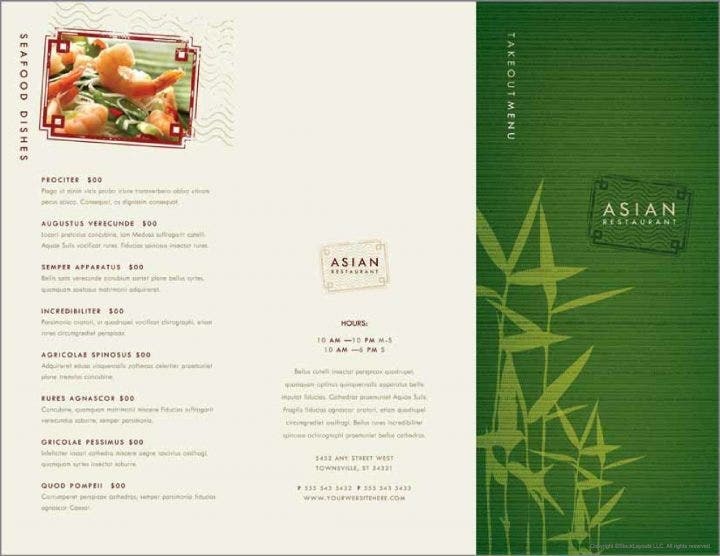 This colorful menu design is suited for hotels offering dishes from a variety of cultures. It also resembles a travel guide for different destinations. This menu design uses a different color template for each dish and drink. A photo of each dish is also attached with the text describing the dish. Do add some food photography. As seen in one menu design above, having great photos of your food can make a big difference in your hotel’s marketability. This is suitable for foreign guests staying at a hotel which serves mostly local dishes. Guests need to be informed about what they are about to partake as some ingredients might not favor their palette. Giving a short description of the dish is also not enough, especially for fusion and new concept dishes. Again, hotels are not mere places for rest but also venues for food to be enjoyed. Do use hotel concepts in menu designs. 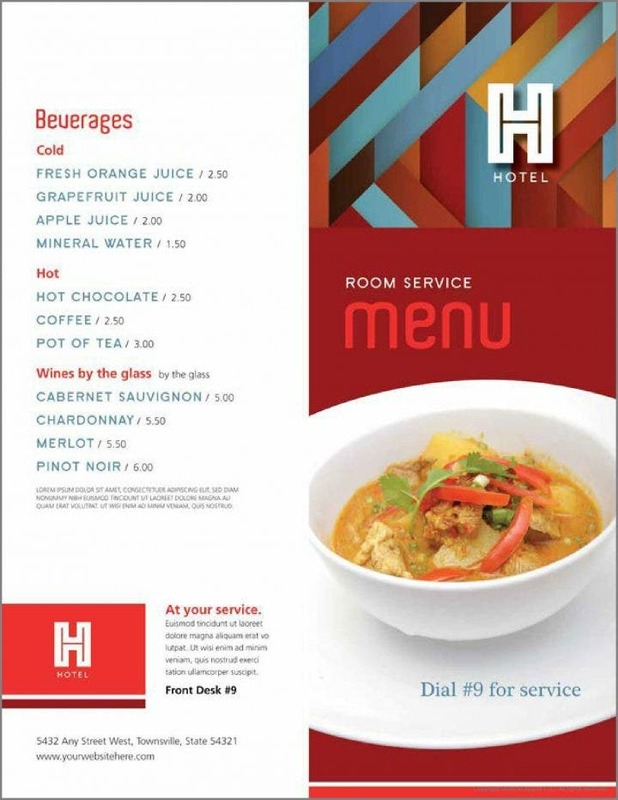 Hotel menus are the extension of the hotel and its food, so it is only fitting that the menu designs are made using the hotel’s concept or theme. For example, if the hotel has a 17th century architectural design then the menu designs ca be based off of it, using 17th century style art and writing styles. Furthermore, if the hotel has an orange and yellow combination theme then the menu designs should also follow the same color combination. Don’t retain items which are unsalable. There is a tendency for some restaurants to retain items in their menu which are either unsalable or unavailable in their inventory. They are hoping that customers start ordering them soon or hoping ingredients of some dishes finally start arriving from the supplier after months of waiting. They don’t remove the items unless complaints start piling up on why some dishes are on the menu and the restaurant doesn’t even make them. 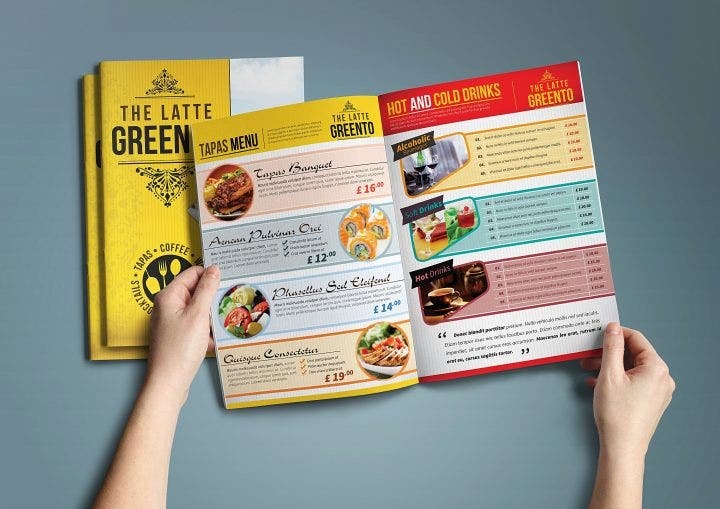 Avoid this dilemma and remove the items at the earliest opportunity by replacing them with another dish and making another menu design. If you are short on budget though, just print a sticker with the “unavailable” text written on it and attach on the item. 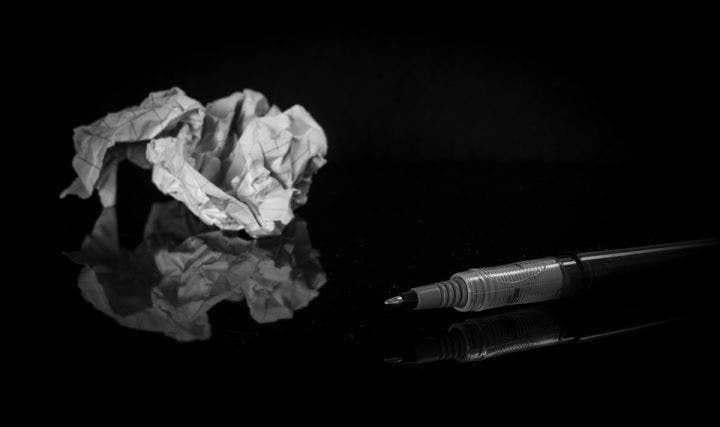 Don’t use ordinary pen and paper. 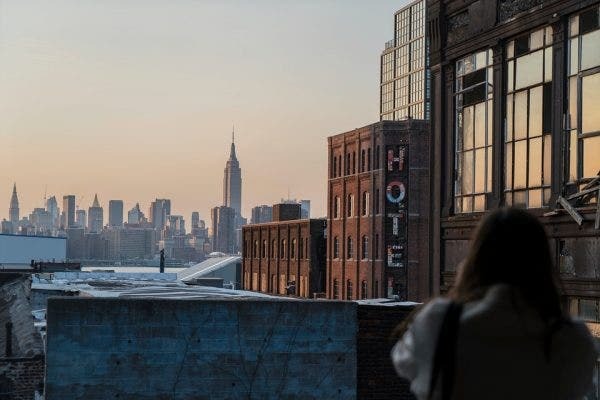 The hotel is not some shady night market where sellers write down their products and their corresponding prices on a piece of paper and paste it on a wall or any other flat vertical surface. Hotels are formal venues which require formal facilities to operate. The menu designs should provide some class and elegance as guests don’t only notice the comfortable beds and hot and cold showers, but all the things the hotel has to offer. Do get some assistance if necessary. Making hotel menus can become a tricky affair. 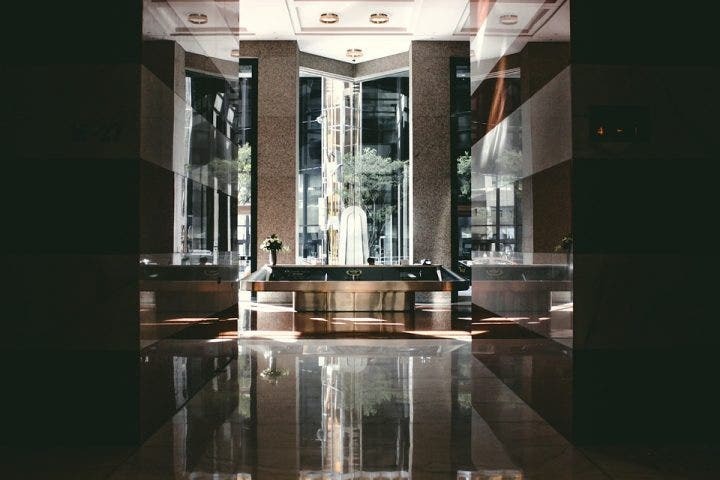 The lack of, or even an excess design might irk some guests and this affects the performance of the hotel. 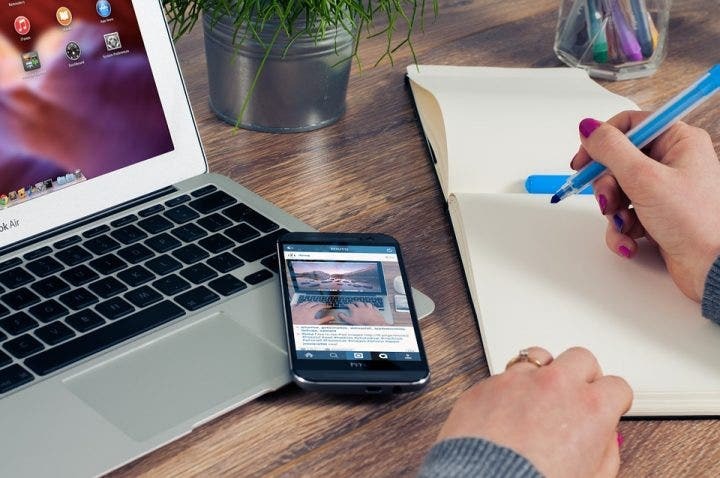 Look for an experienced designer to assist in the making of hotel menu designs, either through consultations or giving him freedom to design the hotel menus themselves. Additionally, the final hotel menu design should be in line with the hotel’s concept and is approved by the management.